This coming weekend Four String Brewing is turning three years old, and they are throwing a party to celebrate the occasion. The 3rd anniversary party is taking place at the brewery on Saturday, October 11 from 4-10 pm. What better way to celebrate than by brewing a special beer, and that’s exactly what they’ve done. Not a wimpy session ale or a kölsch mind you, but a big over the top imperial stout, and this beer has been some time in the making. According to owner Dan Cochran it was brewed last December, bottled in February, and has been patiently aging ever since in anticipation of this event. Three hundred bottles of the Imperial Stout, the first beer Four String has bottled, will be released to the public on a first come first serve basis starting at 4 pm on Saturday at the brewery. 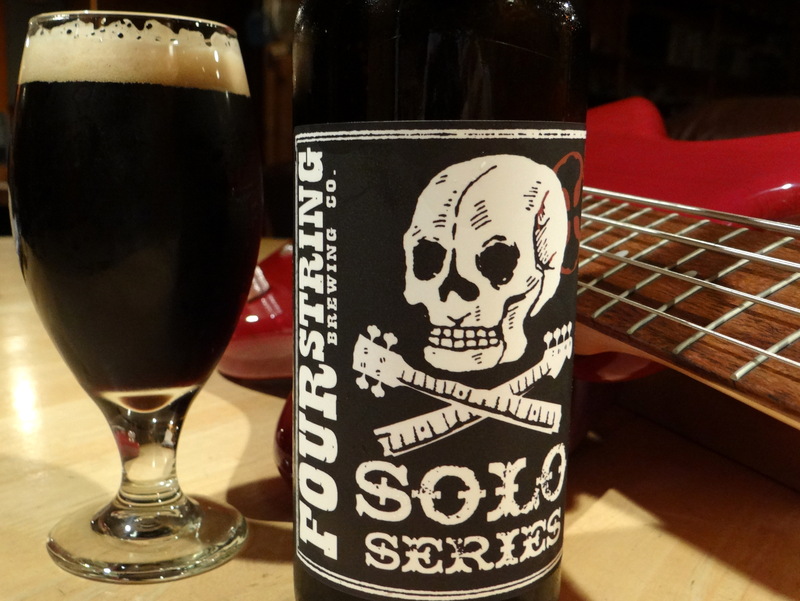 Four String was kind enough to give me a bottle to preview for all of you, so here it is. As mentioned above this is a limited release. The bottle I’m drinking is numbered 28 out of 350. As you might expect the beer is dark, not as black as a Spinal Tap album cover, some ruby highlights leak through when held up to the light, but pretty dark. The aroma is something of a cross between an Imperial Stout and a Belgian Quad. Imagine smelling a juicy plum coated in dark cocoa powder while standing in a leather goods store and you start to get the idea. It reminds me of the nose on the Belgian Quad Pannepot (by de Struise Brouwers), which is one of my favorite beers. The taste is rich and complex, similar to the nose but with less dark chocolate and more plum/raisin notes. The finish is pretty dry for a beer that packs 10.8% abv and a little sour, presumably from the use of a Belgian yeast strain. While I appreciate that they have kept the sweetness from the malts in check, to quote the late Bon Scott I find the sour character at the finish to be “A touch too much”. The mouthfeel is thick and chewy, like a Geezer Butler bass line on one of the early Black Sabbath albums. These sound crazy good and should not be missed. It’s an interesting beer, definitely worth trying. If you do have some come back here and let me know what you thought. Fantastic review! I can definitely imagine the combination of flavors and notes. I’m intrigued enough to give it a taste.